I wasn’t sure just how much Nintendo game designer Yugo Hayashi was joking when he recently told me that he thinks he got the gig directing the new Star Fox because of how close he sat to his company’s top game designer. Well, the man himself, Shigeru Miyamoto, was right there, so I asked him. I was curious how Hayashi had wound his way into the Star Fox gig, given that his two jobs at Nintendo before that involved level design for a Zelda game (Twilight Princess) and directing Wii Fit U. That isn’t exactly a straight line to Star Fox Zero. Miyamoto: In terms of trying to develop a developer I always try to get them to do lots and lots of different things. Mr. Aonuma is kind of always working on Zelda but for most other people I like to try to get them to try lots of different things. So someone who worked on the art direction for Zelda would then go on to Wii Fit U. That’s kind of how I like to do things. And now Mr. Hayashi is working with me pretty much every day. Hayashi: Yeah, I think definitely the closeness of the seats was important to me getting this job. Totilo: Are you literally right next to each other? Nobody in between? Miyamoto: So I guess there would be one cubicle in between, but if Mr. Hayashi stands up he can see my desk. In terms of the development group, he’s the closest. Totilo: Right. And, Mr. Miyamoto, you’re still in a cubicle, right? You’re not an office guy? You’re a cubicle guy? Miyamoto: Basically I’m on the floor. Now, there’s a conference room kind of near my desk and I’ve sort of started to turn that a bit into an office, but basically I’m on the floor. For those not getting that last joke, Miyamoto “flipping the table” has been a thing over the last several years. 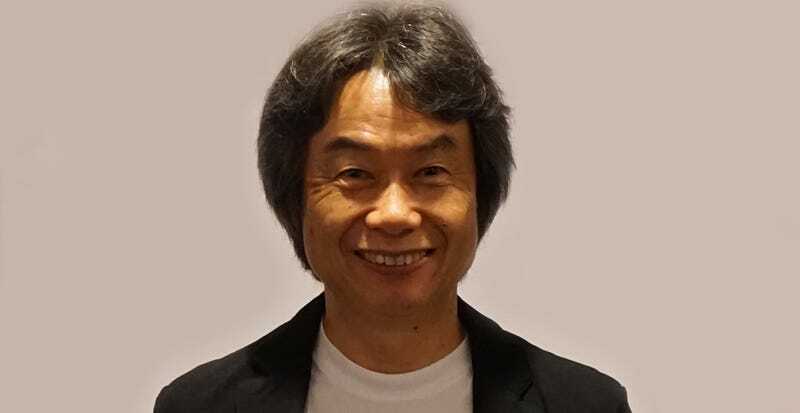 Developers who work for him will talk about how Miyamoto will meet with them, look over what they’ve done and then suggest a smart but very different way to do things, a proverbial flipping of the table.